Though our son is usually very sweet, it seems that his sisters bring out the worst in him. Go figure. 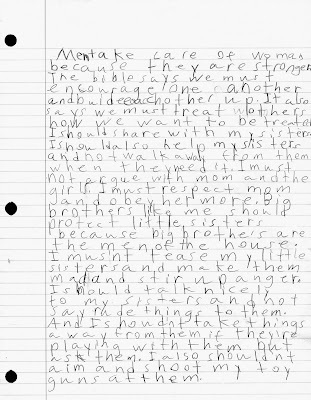 Because of some reoccuring mistreatment toward his sisters, I had Aaron Job to go to his room and write a one page essay on why men should be providers and protectors of women. 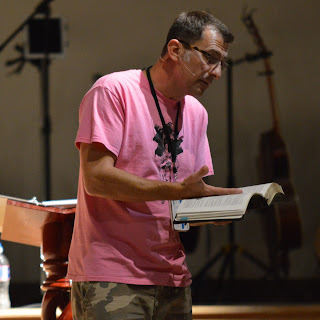 I had to help him with a couple of Bible verses at the beginning, but once he gained some momentum, I think he did fairly well. I tried to retain the original spelling below. Men take care of woman because they are stronger. The bible says we must encourage one another and buide each other up. It also says we must treat others how we want to be treated. I should share with my sisters. I should also help my sisters and not walk away from them when they need it. I must not argue with mom and the girls. I must respect mom and obey her more. Big brothers like me should protect little sisters because we are the men of the house. I mus'nt tease my little sisters and make them mad and stir up anger. I should talk nicely to my sisters and not say rude things to them. And I should'nt take things away from them if they're playing with them but ask them. I also should'nt aim and shoot my toy guns at them. The last sentence is my favorite. I still remember the time I said, "Sarah, we don't chop people with axes-even toy ones." That was soooo sweet! And so timely! Just yesterday on the way to school, we were listening to AirOne and they were talking about God's commandment to children to obey their parents. My 12-yr-old was (as always) listening intently. He's getting to that age where it's gonna be a struggle, but I KNOW that the Spirit of God is in him...now, as for my 7-yr-old...well, let's just say we need to get these boys into church somewhere. Do you have any GENERAL recommendations? Not talking denomination, but rather criteria (knowing full well that I'm not going to agree with EVERYTHING at ANY church)? There's a reason why me and you are talking...I firmly believe that. I love it!!! My favorite is the last sentence, also:). I can tell that Aaron Job's heart is full of truth!! I also should'nt aim and shoot my toy guns at them. It is so neat to see how much he is retaining from what you and Anita are teaching him. It comes out in the verses he references. Great job, guys! I love the gun line, too! Thanks for the nice comments. But remember, lest you think too highly of Aaron Job or our parenting skills... I helped him with the first couple of verses at the beginning.